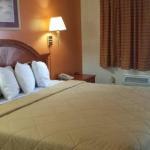 Best Way Inn provides air-conditioned rooms in Seneca. This 2-star motel offers free WiFi. The accommodation offers a 24-hour front desk. At the motel every room has a desk and a TV. The rooms are equipped with a private bathroom with a bath. The rooms will provide guests with a microwave. Anderson is 34 km from Best Way Inn while Clayton is 46 km from the property. The nearest airport is Greenville-Spartanburg International Airport 70 km from the accommodation.